This is the scene a few doors down from work at Reed Space. 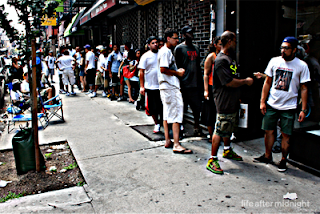 Three kids posted up early yesterday afternoon for the New Balance 575 White Pigeons. At around 10 a.m. this morning I would say they had been joined by another 10 whom had camped out last night. This picture was taken about a half hour after Reed opened shop. It is highly doubted that everyone will be able to get there hands on a pair as Reed only had 40-42 pairs for todays release. Congrats to those who got their hands on them and for those who didn't I am sure you can just go home and log into eBay or head over to Flight Club this afternoon and pick up a pair for a nice inflated rate.